For a half century, a quiet but remarkably resilient strand of activity in contemporary art has been evident – that of artists seeking creative refuge away from the urban sphere, embracing in lieu the context and inspiration offered by the natural environment. Though in a spirit quite distinct from traditional landscape painting en plein air, these artists have sought to mediate, intervene and transform the landscape in ways that are environmentally sound, making use of materials and processes that are part of nature. Their methodologies employ observation, documentary photography, collecting of samples and research to develop sustainable mechanisms of artistic intervention that complements rather than erodes the natural habitat. These artists are striking in their rejection of a century and more of hubris, of the false promise of an urban renaissance driven by the forces of industry and technology. United by their determination to work outside the urban context, these artists reveal both widely differing motivations in their approaches to their work and uncanny similarities in their underlying concerns. Ideally, their practice aims to provide an additive channel of positive flow within the ecosystem, thus allowing for the organic processes of time and natural decay to take their ecological course. Adhering all the while to the primary principles of life –everything grows, everything dies, energy is transformed from one state to another—these works of art can be viewed in terms of process rather than product, as transient and changeable as the environment they seek to mirror or temporarily transform. The eighth edition of Bellevue Salons, conceptualized, curated and arranged in partnership with Chameleon Art Projects, brings together a consortium of voices that posit an understanding of the various forms of artistic interventions in nature taking place in the Indian milieu. Thinking of location and context, use of materials, investigative and research methods, curating and study, these practitioners present their experiments with art, ecology and sustainable materials, attempting to address how the future of artistic production can move towards an equitable approach to the ecosystem that supports and sustains us. Bellevue Salons is a unique conversational platform founded by artist, curator and TED Fellow Sharmistha Ray in 2014. This mobile concept aims to integrate multidisciplinary art forms and augment participatory and collaborative modes of engagement with contemporary culture in surprising new ways. The salon brings together a host of exciting voices from across the world comprising of visual artists, cultural practitioners and curators across a spectrum of artistic and audience engagement across urban and non-urban spaces, with broad perspectives on the visual arts as a medium of contemporary expression – one with continuing political, social and cultural agency in the South Asian region. Chameleon Art Projects is the brainchild of independent curator, Kanchi Mehta. Kanchi studied Permaculture Design, a guide to how we can best mimic the patterns and relationships found in nature and apply these principles to all aspects of human habitation, from agriculture to ecological building, from appropriate technology to education and economics, in order to transition from being dependent consumers to responsible (and ethical) producers. Currently, she is completing her post graduation in Biodiversity Conservation, and is researching various avenues to combine art and ecology to effect awareness and outreach through contemporary, multi-disciplinary approaches. Museum of Goa (MOG) is a space for the arts that brings together artists, curators, collectors, art enthusiasts, educators, students and audiences from all walks of life. It is a non-collecting museum space primarily for exhibitions, but will also organize workshops, residencies, lectures, talks and art courses. 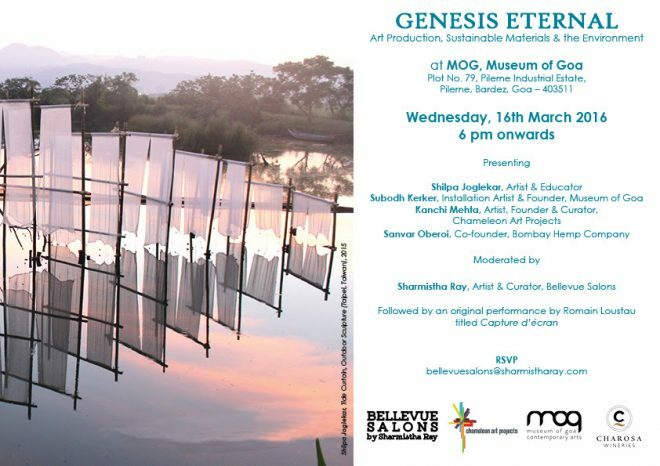 MOG embraces a universal perspective and provides a platform to Indian contemporary artists to showcase their work and connects them with local and international milieus. Spread over 1,500 square meters of space to display art, the museum is centrally located in Goa, and comes equipped with galleries, an art store, café, auditorium and studios for artists.